Familiar push-pin mounts for LGA 775 are installation friendly. Rated at 22dBA, the fan wont wake up the neighbours..
Pre-applied thermal compound on the pure copper base. It seems like Cooler Master is unstoppable in the mainstream cooling arena. Churning out cooler after cooler, it's not surprising to find an entire shelf of Cooler Master products at your local computer hardware store. However, all this is not without reason as Cooler Master products have so far been able to deliver on their promises – maybe not always of the highest enthusiast quality, but they do they're job well. Their latest Hyper TX Cooler for LGA 775 boards is no different. 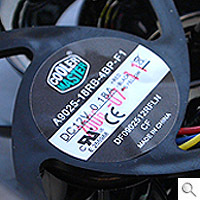 The Hyper TX Cooler from Cooler Master is one of the latest LGA 775 coolers to line their extensive portfolio. Measuring 90 x 44 x 136.5mm though, the aluminum and copper hybrid Hyper TX might pose a slight problem to some slim cases without the height clearance needed. Height isn't the only thing going for it too. Wrapped around the heatsink is a 90mm fan and an oddly shaped transparent-black shroud held together by a rubber screw. To get a closer look at the inner workings of the Hyper TX, we took the liberty of attempting to uncloak the mysterious shroud – only to discover a sleeve-like assembly free from screws! The only link that holds the fan and shroud together are a series of rubber plugs that double as bungs to cling on to the heatsink. All we needed to do was to shimmy the shroud upwards and the heatsink was home free. 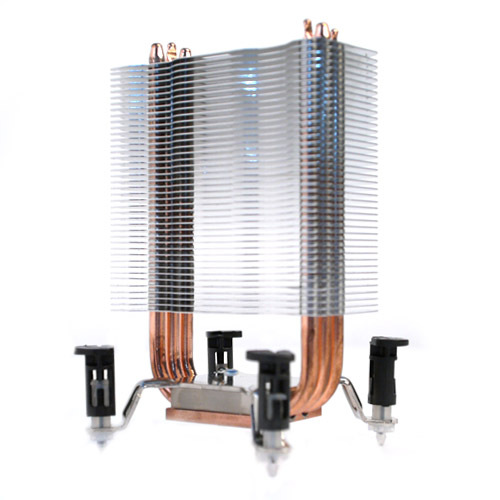 Naked, the heatsink has 41 aluminum fins impaled by 3 distinct copper heat-pipes, which in turn were bolted onto a pure copper base. We also took note of a fair amount of pre-applied heatsink compound on the copper base which came in handy for quick installation. 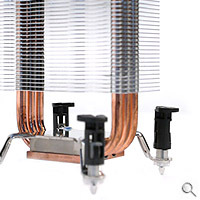 Increasingly, motherboard manufacturers have been introducing 'silent' heat-pipe cooling solutions as a carrot to attract enthusiasts looking for a quiet, high-performance motherboard brimming with features. Often 'daisy chained' together, the chipsets and MOSFETs share the load and evenly dissipate heat through the passive heatsinks found on them. All this sounds good until the question of "where do all this heat go to eventually?" pops up. 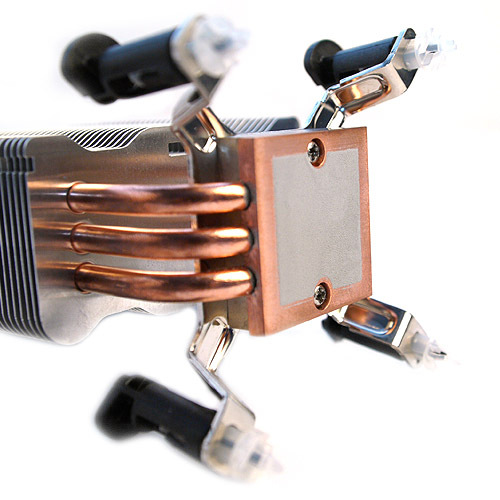 Passive heatsinks are just what they are - passive. If your casing does not have proper air flow or circulation, heat will basically build up around the enclosed area. 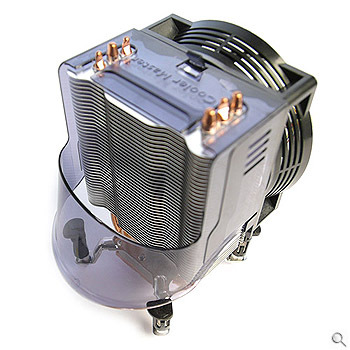 Most CPU air cooler will help in air circulation, but the shroud from the Hyper TX actually redirects air downwards towards the most important areas so that the MOSFETs and even chipsets are considered actively cooled. The propriety 90mm fan that is attached is rated at 0.18A and a low 22dBA. At its maximum speeds of 1800rpm, it is able to move 41.76CFM of air. With that said, we surely had to put the Hyper TX to the test and promptly reassembled the cooler by attaching the shroud and fan back on again. We then proceeded to install the heatsink to a motherboard using its convenient push-pin mount (similar to ones found on Intel stock heatsinks), and fired it up. 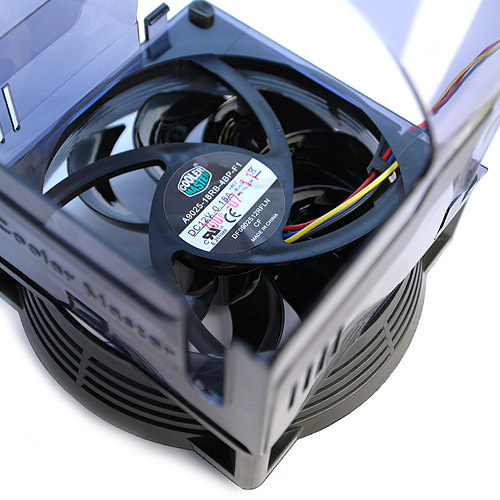 The fan was silent and was actually able to produce a fair amount of airflow – both through the CPU heatsink and down towards the MOSFET area. 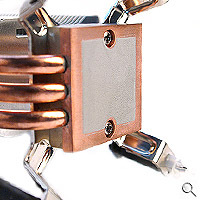 Certainly we take our hats off to Cooler Master for a simple yet ingenious way to cool CPU, MOSFETs and chipsets together (if linked via heat-pipe that is). Cooler Master's Hyper TX is a cooler that is designed to take into account both the CPU as well as the important power components at the back of the CPU socket. 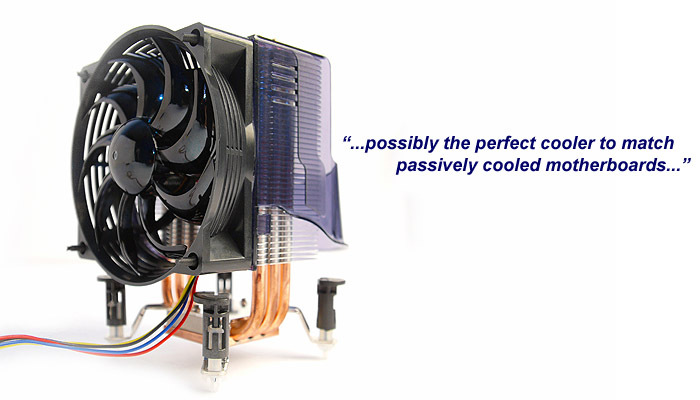 With its elaborate shroud design and a decent silent fan, the cooler manages to do its job well. However, since the shroud will only cover an area behind the cooler, it really depends on your motherboard and setup configuration on whether you get optimal cooling from this. Otherwise, the Cooler Master Hyper TX cooler surely fits the bill as a fine cooler to match passively cooled motherboards. Take note that the Hyper TX is available in two variants: one for Socket LGA775 CPUs (which is featured in this article), and the another version that caters to Socket 939/940/AM2 CPUs. Unlike many new coolers going the universal socket route, the Hyper TX is unfortunately not able to embrace this. The Hyper TX is available now at a RRP of SG$49.